I am experiencing some tire to inner plastic fender rubbing during suspension compression at speed. Worse now with 255/45R17 up front. I found a thread where Sickspeed mentioned he relocated his inner fenders (I assume for this reason as he's running pretty low). My front fenders are about 25.5" from the ground right now. Does anyone have any info on relocating/raising the inner fenders for more clearance? Over the years I tried a few things but none to my liking. There is no good way to attach the stock liner to the fender from my perspective that I liked when running larger tire and lowered. I also have 255/45/17 with ATS spindles and 25" to ground as measured from the lip. Suggest also changing the liner fasteners, two at the top, to a button head type as its a little easier on the tires when pushing it hard. In the end I am living with the contact and will change the inner liner when I burn through them. Good tips on the button head fasteners. I think I'll do that and have a spare set of liners on hand when they're spent. I added the Blazer ZQ8 jounce bumpers some time ago and they did help me a bit on minimizing the contact. When you go that low up front driving the tires into the inner wheels is the result. Going to a much higher rate spring will slow the compression down, like a 1000 IROC spring. But who needs that. Better adj compression shocks can help slow things down too. I run a 640 spring, ZQ8 stops, 26" tires at 26 1/2" ride height, have no rub and have airborned the car a few times. But that's me, can't run those very low ride height numbers around here. 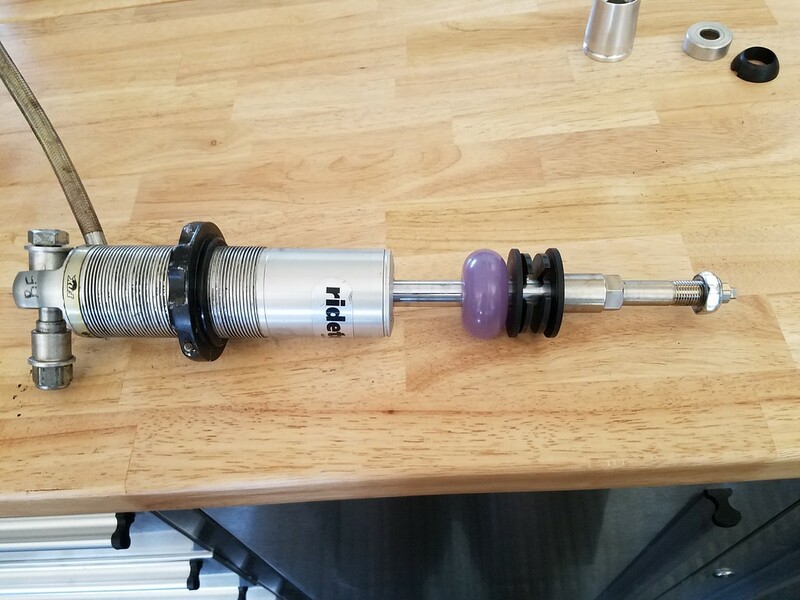 The 67 Camaro I play with occasionally has the rub problem because he wants it to ride better, soft coil over spring and low compression setting on the Viking shocks, we replaced the inner bolts to help the rub, a little. I used an Eastwood fender roller to push my inners up a bit. Not quite conventional but I was desperate for any room I could get. I took the bolts to the metal fender out, pushed that part of the inner up until it passed the metal lip and it stuck there. Gained me about a half inch at the very top. It still rubbed, so this was my alternative fix. Thanks for the insight, fellas. I'm running Eibach springs up front (which I believe are in the mid-600# neighborhood? ), Bilstein HD shocks, and the ZQ8 bumpstops. I think it rides quite well so I'm not ready to change over to coilovers yet but I know I will eventually get there. I like the idea of rolling the inner fender lip in/up to help raise the fenderwell. I will swap to button head bolts before or during this modification to help things. Nice to know more inner fenderwells are available! Not sure what SSon20s did, you might look some of his posts to find out. He hasn't posted here in a long time though, good luck! Search for member “bagnut” as well. I can’t remeber what member has his car now but it’s another member. Years ago I remeber sickspeed mentioning that the cutlass has a different inner that might lend itself to adusting better than the Monte ones. As with most things there is no perfect solution. Thanks for the member names. I found a thread from Bagnut that shows he used what looks like trailer fenders as inner fender wells. Decent amount of chopping done but definitely effective. I dont know if corey browning is on here, but he runs cut up trailer fenders too. Looks really good. ^ Corey did an awesome job on his. I used to have the same problem years ago with my 88SS. The setup that works best for me is Moog 5660 springs with one full coil cut off the top for my ride height and bilstien shocks all the way around. I tried Eibachs and I also tried drop spindles, neither worked for me without tire rub. The springs and shocks listed are what I am running on my 83SS as well with 17x8 wheels with 245/45R17 tires and they have never rubbed. 1983 Monte Carlo SS Turnkey ZZ4/700R4, Dakota Digital Instrument Cluster, 77k mile car. Many more mods to come soon. All I did was bend the tabs that mount the inner fenders to the inner structure of the fenders and drill new holes. Cory is on Facebook/Instagram these days. He runs the G Body Nation page on FB if you need to find him.